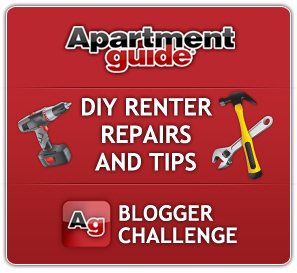 I am excited to have been asked to participate in Apartment Guide's DIY Renter Repairs & Tips Bloggers Challenge. If you didn't already know, the Hubby and I are actually renting the home that we live in. I have always been of the opinion that it doesn't matter whether you rent or own, making your home "your own" is important. When we lived in Massachusetts, we owned our home, and yes, that does come with DIY opportunities that renting doesn't. That said, however, there are many easy (and reversible) ways that you can personalize a rental. Remember this space that I shared a couple of weeks back? This is my undecorated (and messy - my apologies) dining room. I'm going to share a very simple update with you that will change this space dramatically. 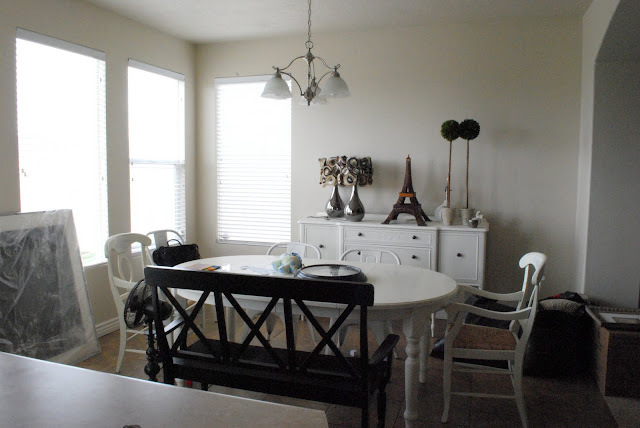 Look for that, and some other easy-to-achieve ideas that will help you update your home without a lot of time, stress or money - as well as a fun giveaway to help you along the way- all coming up in my DIY Renter Repairs & Tips Bloggers Challenge post next week! I'm off to tackle those projects!! I can't wait to see what you come up with. Renting or with a mortgage (isn't that most of us?) a home is a home and it is what you make of it. Filled with love and a few pretty things and we're all happy. I'm so glad that you pointed out that "...it doesn't matter whether you rent or own, making your home "your own" is important." Sooo true! Oooohh, it sounds wonderful! We have just bought a house after renting for a few years and we are in the process of making it our dream home. I love your blog - it's one of the first I bookmarked and I will definitely drop in to visit again to see all the lovely advice. God Bless. I can't wait to see what you come up with and congrats on being contacted..I am sure you will have the most original and clever ideas for them..Have a great weekend..